The other week I attended yet another academic trip provided by the Archaeology department of Bar Ilan University. However, this trip was not dedicated to history or archaeology but rather in the pursuit of wildlife, the first of several trips associated with a wildlife class that I’ll be taking next semester. 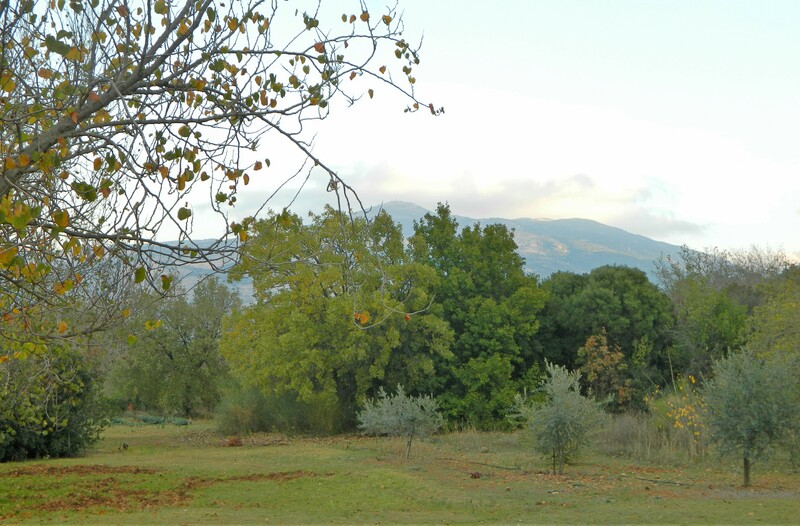 Along with my friend and brewing partner Ben, we found ourselves spending two days in the lush Hula Valley region. 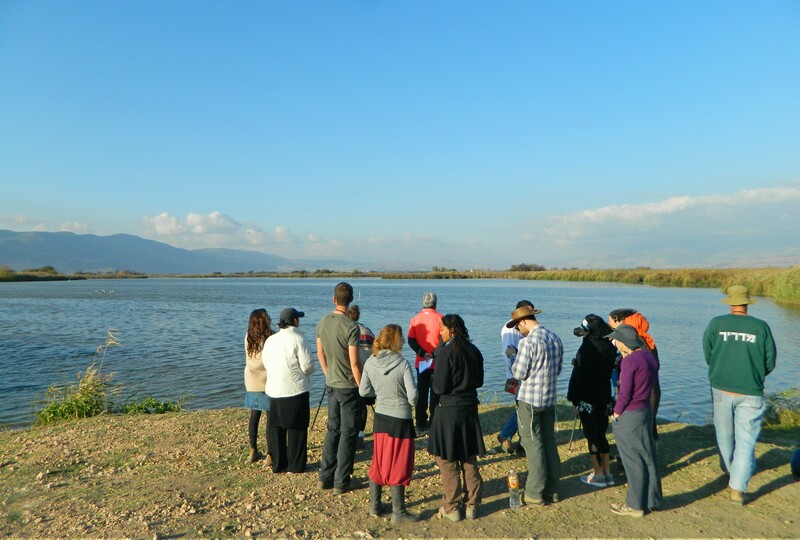 The first day we drove from BIU up north, directly to the southern of the two Hula Valley parks. This one is part of the Israeli Parks Authority with the standard entrance fee, whilst the other belongs to JNF/KKL and is basically free, with a suggested donation of five shekels per person to help fund the crane feeding efforts in the winter. Being that I have covered both of these parks on my blog in the previous years (HERE and HERE), I shall just touch upon our activities and the unique species sighted. Disembarking at the park we were immediately treated to wildlife, with a few black kites circling over the tall eucalyptus treeline and a large flock of gulls directly overhead. 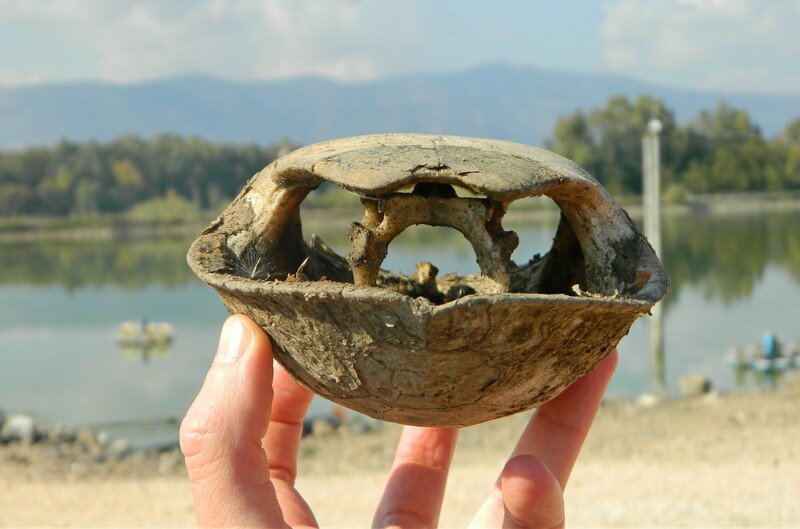 Our guide and course lecturer, Dr Moshe Natan, led us over to a quiet spot to introduce us to the region and its recent revival after having been dried up in the 1950s. He informed us that these two days were to be dedicated to watching the different species of wildlife around us in their natural surroundings, going about their daily lives. With an emphasis on waterfowl, I knew that there’d be interesting things to see. 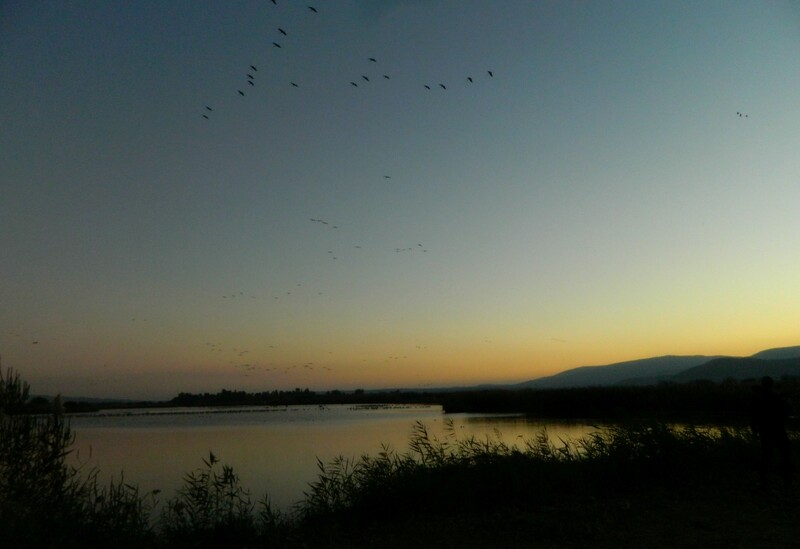 Plus, the Hula Valley never disappoints. 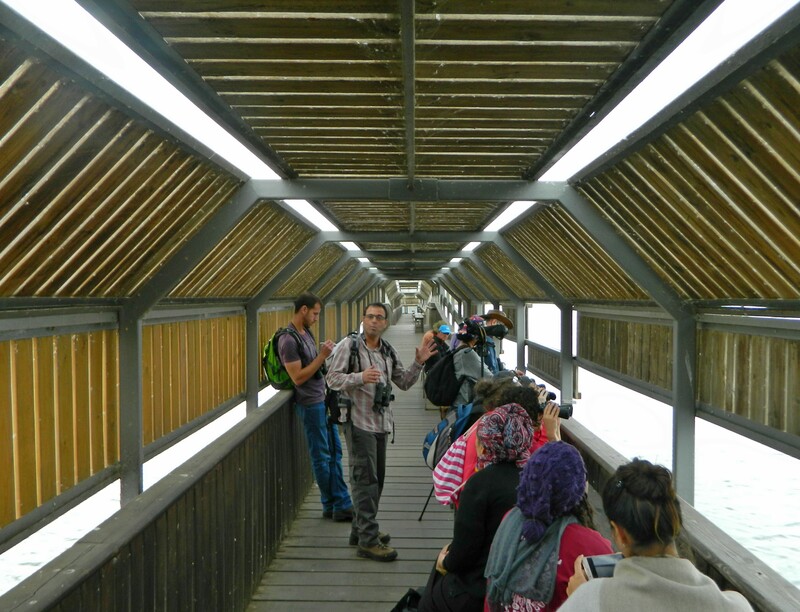 With the sounds and sights of small flocks of common cranes flying overhead from time to time, we began our tour. Straight away we saw an interesting sight, a small waterside tree hosting perhaps a dozen or more night herons. Then, darting about with quick dives into the murky waters, a common kingfisher made a nice show. But my attention was arrested by the presence of a marsh harrier which made close flybys, searching for prey in both water and grass. I had received a pair of 7×50 binoculars from Dr Natan, which made it much easier to track and watch wildlife. However, when the opportunity arose, I picked up my camera and captured the moment in a more permanent form. Within the first half hour or so I had already seen two waterfowl species, new ones for me–a shoveler and a gadwall. One thing that I love about wildlife-rich places such as the Hula Valley is that there is always what to see, you just need to be aware of your surroundings and be prepared for anything. Next we checked a bat box, which was empty, and then the lecturer taught us about pellets, showing us samples picked off the ground. Likely belonging to a kestrel, the regurgitated pellets contained identifiable insect parts. Moving on, we spied on several species of herons and egrets and even spotted a black-shouldered kite on a tree several hundred metres to the east. My next special sighting was a little grebe, diving into the water in the company of coots and mallards. Moving along nicely, we entered an open area with a large muddy patch populated by waders and wagtails. There I added a few more new species, including a common snipe and Eurasian widgeon. A hefty wild boar popped out of the thickets up ahead of us, only to disappear once it saw us watching it. But the greatest sighting of the day, and of the entire year thus far if I’m to be honest, was that of a white-tailed eagle… I was scanning the horizons with my naked eyes, and spotted a dark dot atop a tree some 700 metres to the west. 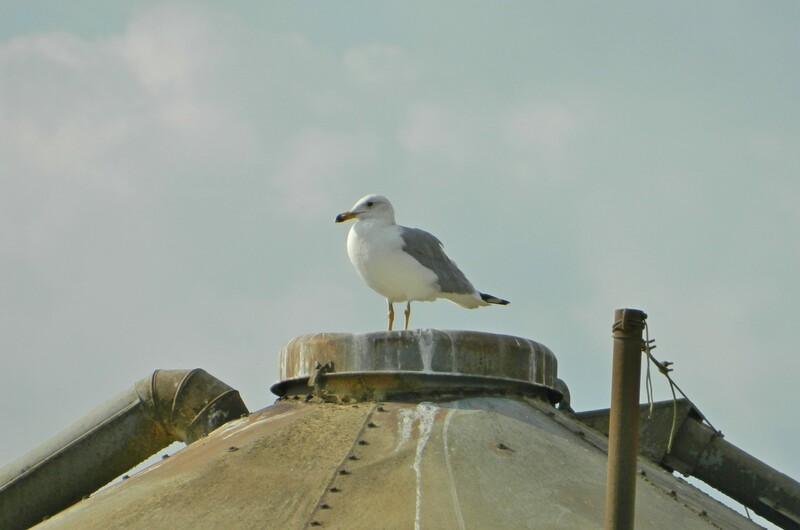 I got a closer look with the binoculars but that wasn’t enough – all I was able to decipher was that I was looking at a dark-coloured bird of prey. I found one of the two spotting scopes and sighted it. 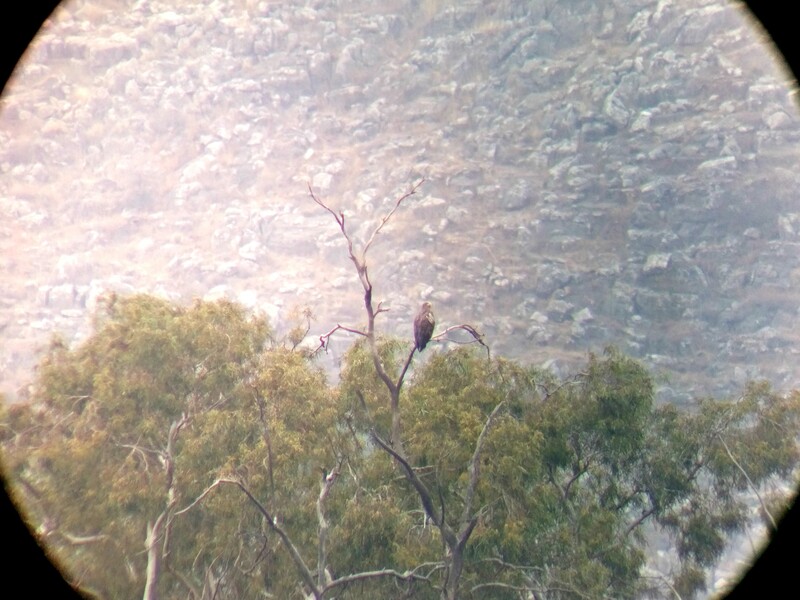 At this point I was torn between the likely and the unlikely: it was either a buzzard, which is very common in the winter, or a white-tailed eagle, of which there are very few in Israel, and in the world at large. I consulted our guide and he uttered the words I was too hesitant to say myself: white-tailed eagle. Not only an impressive and huge bird, this one had a shoulder tag marking it as L21. When I reported the sighting to the birding group on Facebook I was informed that this L21 was a female born in Ireland in 2011 and was brought to Israel as part of a rehabilitation program. She recently raised two young, one that fell out of the nest and was killed by jackals, the other fledgling successfully. Needless to say, it was hard to continue on with the tour after such an incredible find. Yet we persevered and walked through the reeds to the lake blind where we were treated to the scene of hundreds of birds in and above the water. 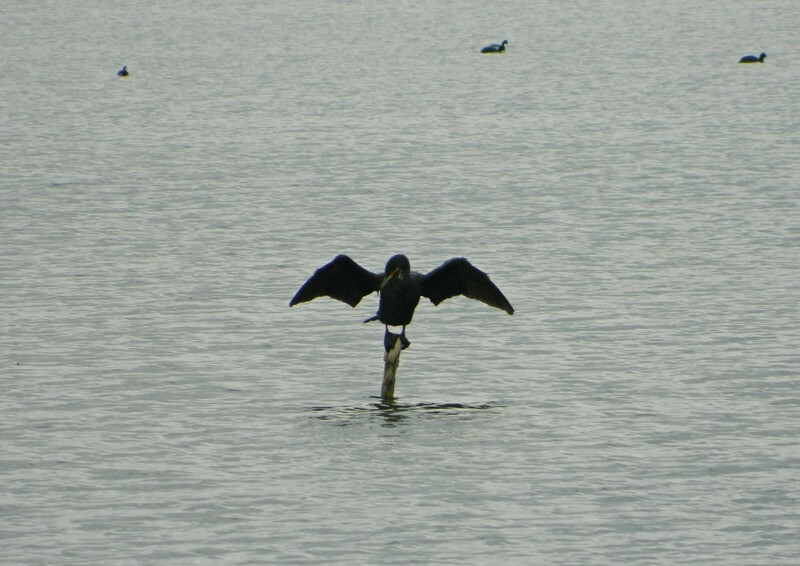 The majority were cormorants and gulls, but there was the occasional pelican and even a spoonbill. Far across the lake we spotted a water buffalo, also reintroduced to the area after local extinction following the marsh’s drying in the 1950s. Looping back around the way we came, we took a few minutes to watch a nutria feeding on plant stalks. 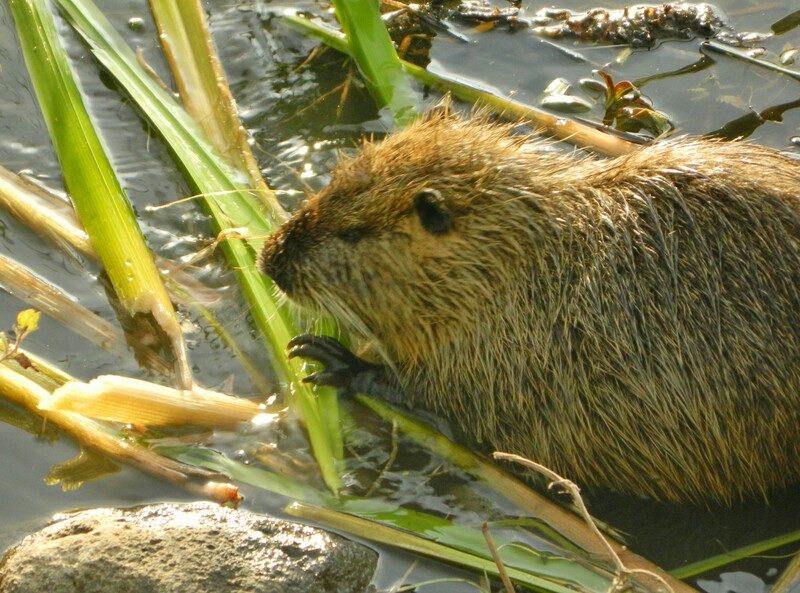 The nutria, also known as a coypu, is a large rodent species that was brought over from South America to be harvested for their fur. Eventually that program was abandoned and the nutrias made their way to the wetlands where they live happy, albeit somewhat destructive, lives. Back at the bus we boarded and were driven up to Kiryat Shmona, at the base of Tel Barom, where we were let out to buy groceries for the evening. Ben and I tried climbing the tel to see if there was anything interesting to see but the way was tricky and we abandoned our efforts. 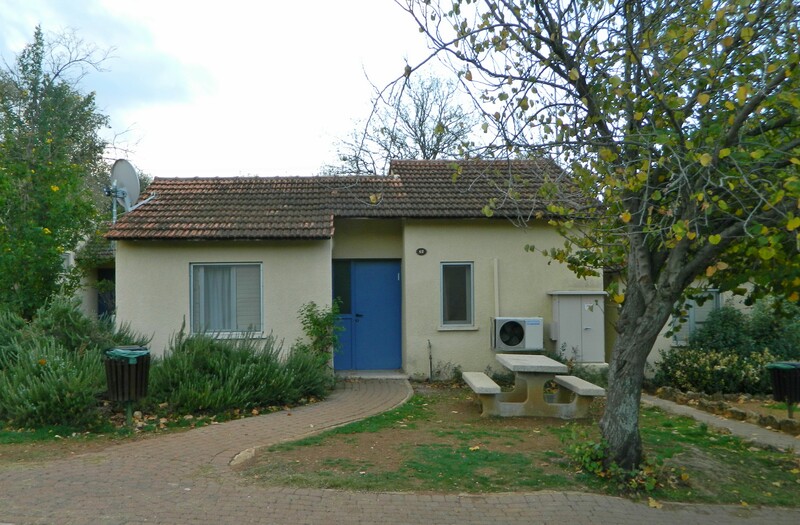 We were then driven to the Hermon Field School in Kibbutz Snir where we were to spend the night. Much to our surprise we were all alone in the big place, and Ben and I ended up splitting a small cottage, each of us getting our own room. Because it was the second night of Hanukkah, we held several candle-lighting ceremonies and then we ate dinner. Afterwards, at the end of the evening lecture about the importance and purpose of vernal pools in nature, Ben announced to me that there was the Geminids meteor shower that night. Of all nights to have a meteor shower, we were in the perfect setting. Determined to catch it, we explored the compound looking for the darkest place to properly view the night sky. But then, adventure struck, and we found ourselves with a few other members of our tour hopping the fence and journeying down to Nachal Banias below. It was a fun little excursion and we ended up seeing several shooting stars, some rather impressive. 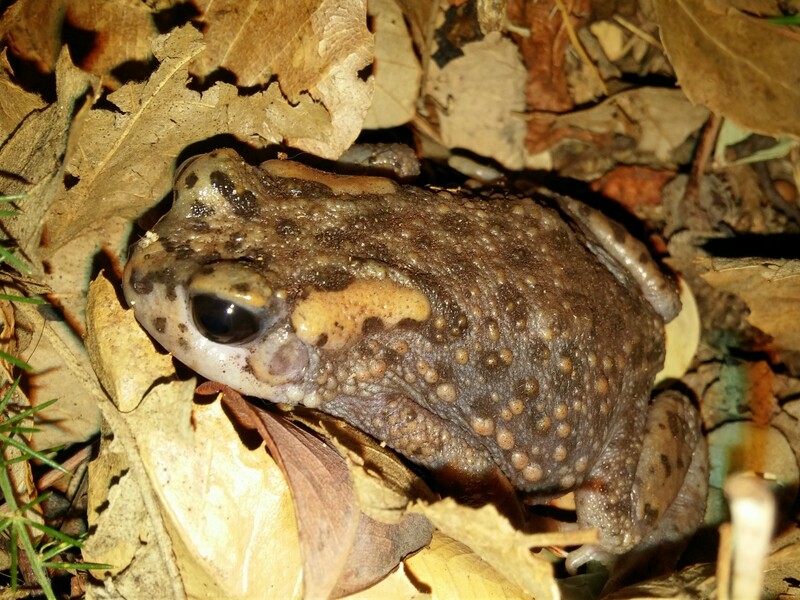 After some stargazing we headed back into the compound, passing an interestingly pigmented green toad, and went to sleep. The next morning began quite early with praying, eating, and a short tour of “woodland” birds seen within the compound. 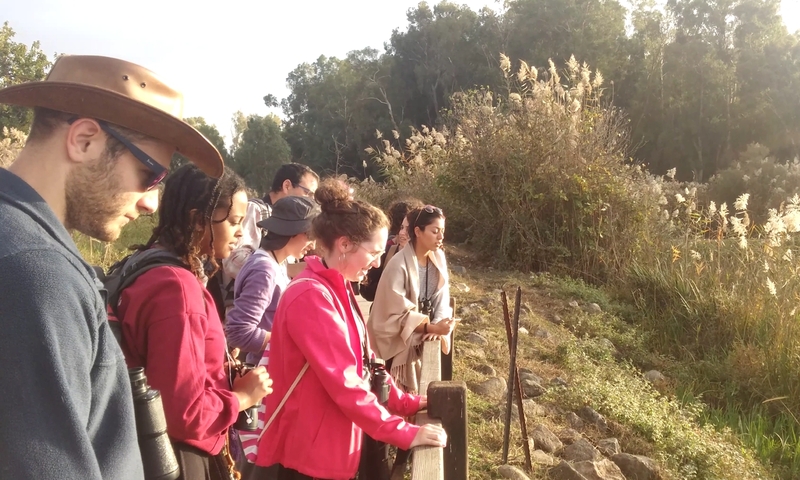 Our first destination of the day was the fish ponds at Lahavot HaBashan, where we sat as a small, compact group to observe the nature around us. There were predominately common species, which we had seen the day before, but there were a few nice sightings including a squacco heron and a family of mongooses crossing the dirt road near us. Just for kicks, Ben and I brought bottles of cold Leffe Brown with us, opening them whilst sitting on the ground watching gulls and herons. After the beers we, as a group, got up and began a short walking tour of the fish ponds. Passing along an overgrown water channel we startled both a golden jackal in its lush winter coat as well as a marsh harrier that was busy eating a fish. Other fun sightings included another black-shouldered kite, a few dead turtles and the bones and feathers of a dead pelican or two. 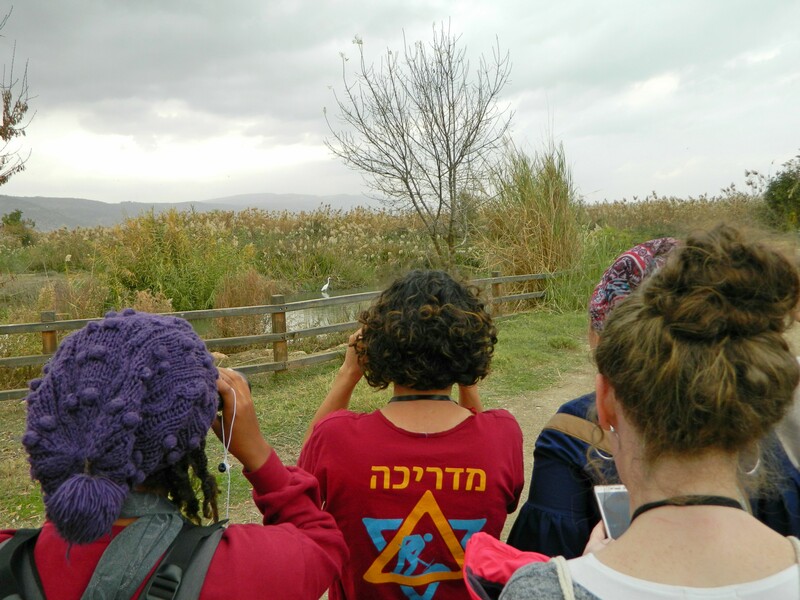 Back on the bus we headed straight for the other of the Hula Valley parks, Agamon Hula operated by the JNF/KKL. Having a quick lunch first at the visitors centre, we regrouped on our bus and entered the park along the paved roads. To my delight, I noticed that the birds seemed less afraid of us and allowed us to get much closer than I would have even gotten on-foot. But, there was a drawback, and that was trying to take photographs through the dirty bus windows. 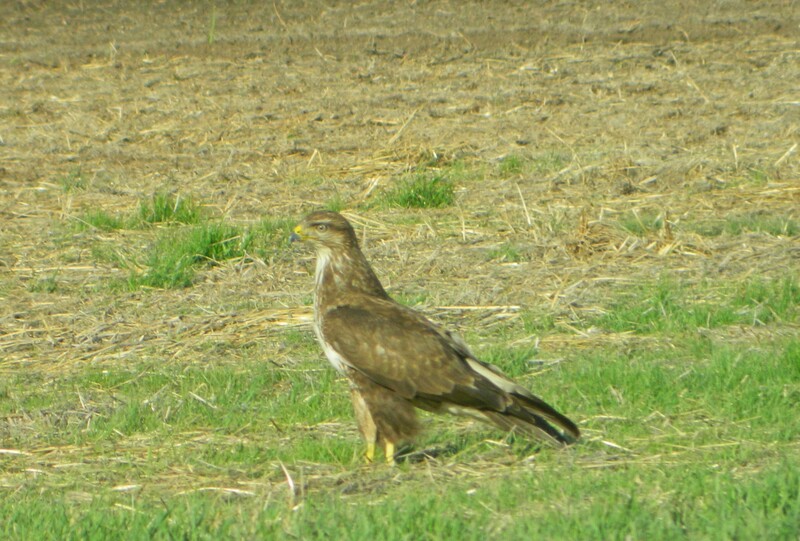 My favourite birds to see so close-up were the common buzzards, of which there were several. 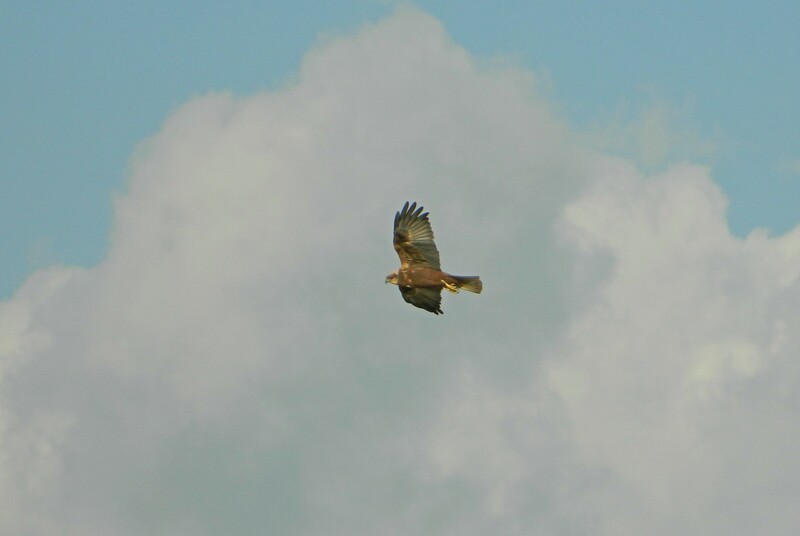 At one point there were two buzzards on the banks of a water channel just alongside us, it was such a surprise that it took me a few seconds to register their presence. Some minutes later, while overlooking the main lake, we took in the sights of the many species of waterbirds, and the birds of prey providing a constant threat from the sky. On the far side of the lake, we visited a fallen tree, where eagles are known to perch. 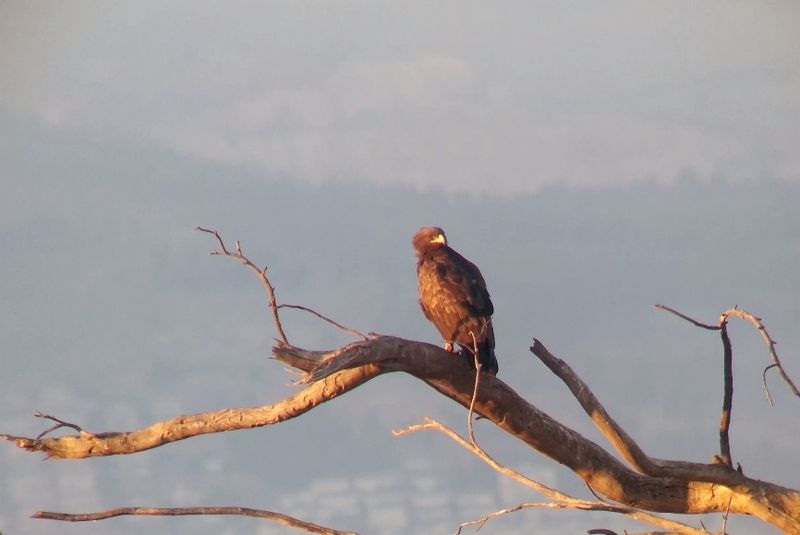 Sunset was approaching and I was able to take this photo of a greater spotted eagle in the light of “golden hour”. Even with darkness incoming there were still a few things yet to see. All throughout the evening, and particularly with the onset of dusk, the tens of thousands of common cranes were making their way to the bodies of water to spend the night. The sounds of their calls filled the air, transporting us to a seemingly different world, as the sun sank over the Naftali mountains to the west. At last it was dark and the cranes fell silent, but there was still more to see. Every so often we’d catch sight of a small fluttering shape against the sky, easily deciphered as bats. These were tiny microbats, feeding on the many mosquitos in the wetlands, identified as Kuhl’s pipistrelles by our guide. Bringing the tour to a close was a quick visit to a peculiar pipe protruding from the ground, which, when the valve is opened, release natural methane gas produced by the decaying organic matter beneath the surface. Standing in the darkness we were soon greeted by the gift of light when our guide ignited the tapped gas, and sufficiently illuminated, we learned about this natural resource as a theoretical energy source. With that we boarded the bus once again and off we drove, to the busy city life of the country’s centre, bringing a close to yet another fantastic trip with many memorable moments. Two videos of this trip, which I made for the department’s YouTube channel, can be found HERE and HERE. Great and comprehensive writing as always. A keen eye that always sees wildlife others don’t even suspect. Wishlist: macro shots of tiny wildlife. Thank you Zev! Always nice to see your feedback. Nice to see natural areas and wildlife in Israel! 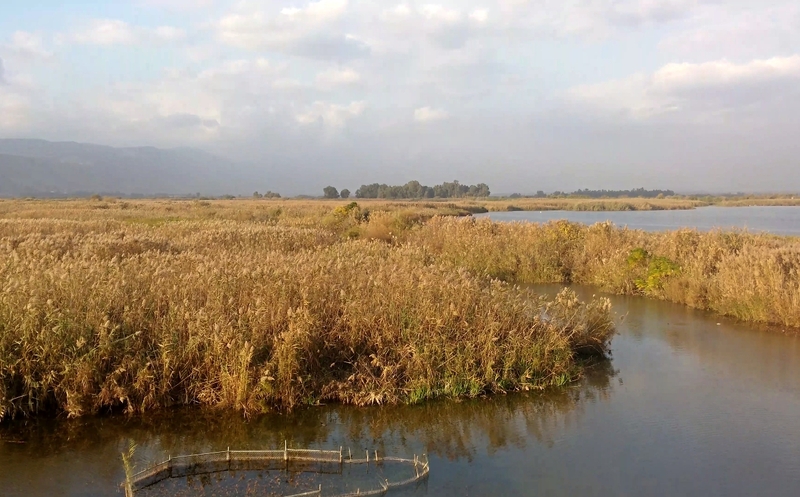 Thank you, the Hula Valley is truly one of the best places to see a wide variety of wildlife.